eCommerce is one of a viral keyword you will see literally anywhere when you go online. It is the tool that brings businesses to the next level. Any business owners are striving to make the most out of it. Applying Premium eCommerce WordPress Themes is a smart way to help you do that. Yet, there are few things that may make you bewilder your mind. What are key criteria for usable eCommerce WordPress Themes? Which theme should I choose out of tons of themes in the market? This article will give you answers for both of them. The first thing you should bear in mind while choosing eCommerce for WordPress website is navigation. Navigation will decide whether your customers will stay or not. Clear and fast navigation urges them to linger in your online store while poorly managed one may cause them to leave just a few seconds after coming to your online store. So, how can an eCommerce WordPress Theme generate an easy navigation? An essential segment you may have already known is Mega Menu. Mega Menu, whether in horizontal, vertical, or drop-down style, is a great asset that helps customers navigate around your store with ease. A fully-fledged mega menu has categories to be designed neatly and consistently. You may check if the theme supports you to arrange categories in a chunk or embed links with ease. Also, make sure there are enough resources to highlight and make your categories scannable such as typography, color, and buttons. Also, sticky mega menu will be a bonus point. Your customer can reach any inner pages without much scrolling with sticky mega menu. In particular, it should be responsive and fit perfectly on any devices. Another important segment of the powerful eCommerce Theme in WordPress that people tend to pay less attention to is footer. Footer is not merely the room for legal links, contact, or mail subscription, it can be used for displaying payment methods, resources, sitemap, search tool, hot deals, upcoming events, latest blog posts, testimonials, call-to-action, social media buttons. There are tons of things you can feed your footer. However, you need to be selective in putting the most useful elements for your customers. Wrapping 5-7 elements in footer will be the best practice. In brief, the theme should equip you with tools and widgets to craft a feature-rich footer. When it comes to product showcase in eCommerce store, physical experience is the most obstacle. In other words, an online store can rarely win over a physical store in terms of physical interaction it produces. Though customers are not able to actually touch or feel your products, there are some ways you can pull them closer. A functional eCommerce WordPress Theme will assist you a lot. By means of supporting high-quality images with Zoom tool, color swatch, size chart, the theme allows your customers to see pattern and texture details more vividly. Plus, catchy lightbox display and well-organized layout to present product descriptions, reviews will make a better context for your products to stand out. While searching for desired items, customers may run into the ones that are close yet not enough to meet their demand. Thus, they will either abandon your site or keep on searching, which equally costs them time and causes frustrating. At this case, related products, up-sells, cross-sells suggestion is the optimal solution. This technique may be prevalent, but not every theme can help you practice it effectively. 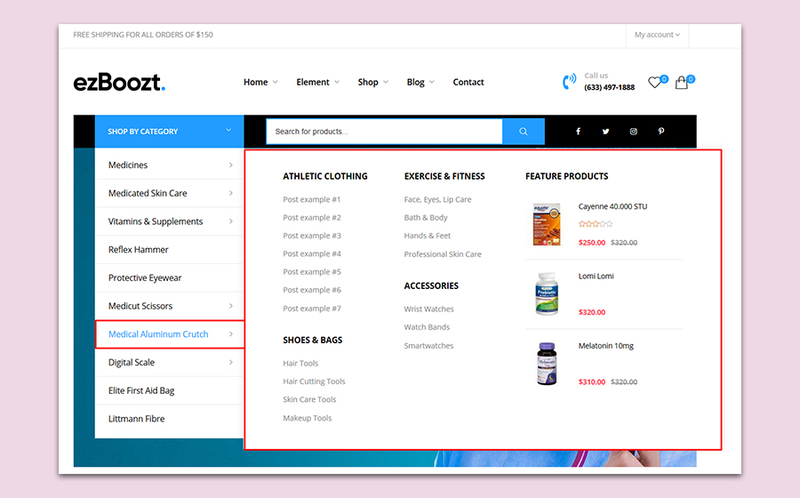 The right eCommerce WordPress Theme should be the one that supports displaying this section clearly, directly linking customers to the product pages or categories with expected criteria. While being mesmerized by sparkling designs, cool effects, and transitions, you should also take a closer look at how reliable the eCommerce Premium WordPress Theme you choose is. Reliability includes stable performance, customer satisfaction, and customer support before, during, and after purchase. This is especially important because you obviously don’t want to be abandoned with anything but an underperformed theme after purchasing. Thus, you will want to check reviews and ratings first and foremost, see how customers react to and a share their experience with the theme and theme provider. You can find reviews and ratings easily in product page, social media platforms where theme users discuss about it. 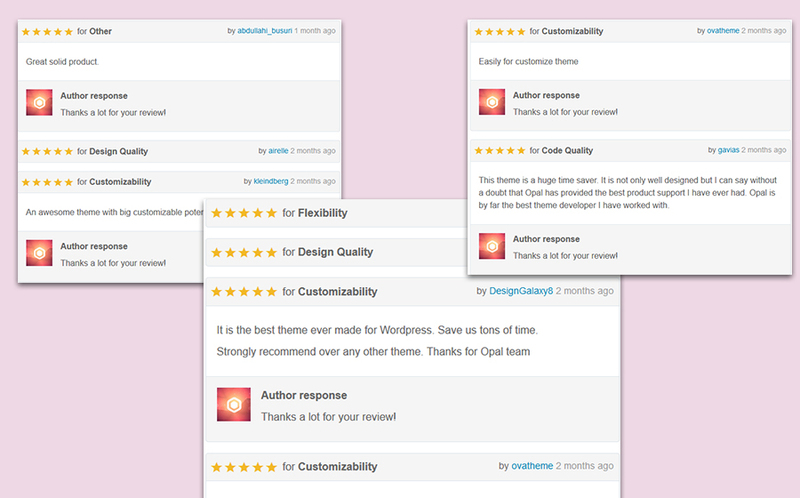 In such interactive marketplace as Themeforest, reviews and ratings section is super easy to spot. In addition, it is crucial to skim through the Q&A sections. Whereas you haven’t had any queries yet, you can be prepared to unexpected issues you may encounter while using the theme like other users. The best part is you can see how theme provider deals with the questions and how well they can support their users. If possible, inspect the theme in live websites. Every component may look flawless and perform excellently on demos but mess up when you present contents. For that reason, a brief investigation into how theme other users in your industry manage the contents is definitely worth your while. Here is a keen collection of eCommerce WordPress Themes for various business ideas. Check them out! 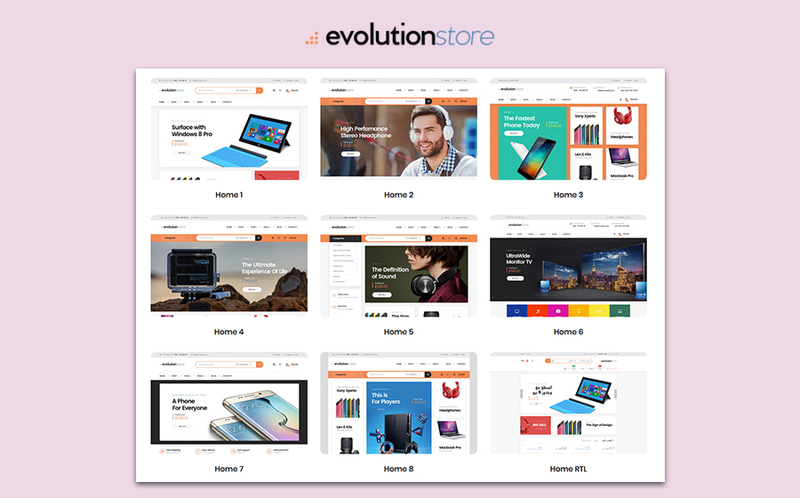 You are so close to the ideal theme for your store! 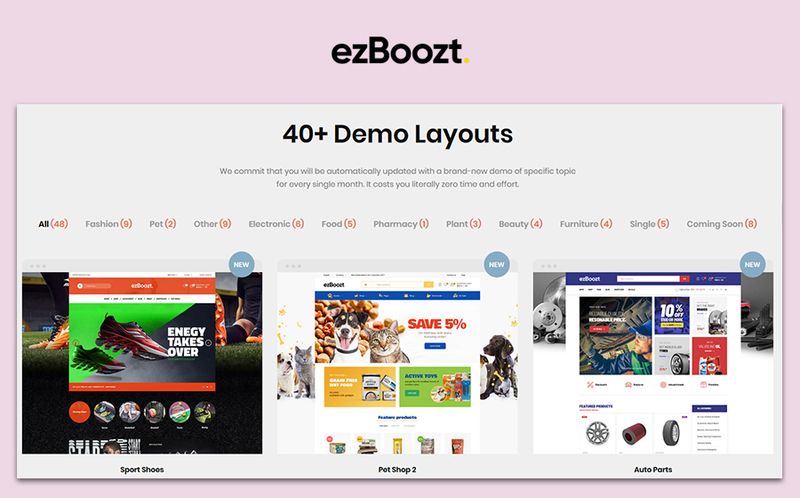 ezBoozt gets you loaded with a myriad of decent demos geared to showcase any kind of businesses. This Multiconcept WooCommerce WordPress Theme brings you a product-focus niches ranging from food, garments, accessories, cosmetics to gadgets, electric equipments, and the list goes on. In particular, you will get 3 demos automatically updated in your dashboard each month. Plus, it is optimized to perform smoothly and lightly for your best SEO score. 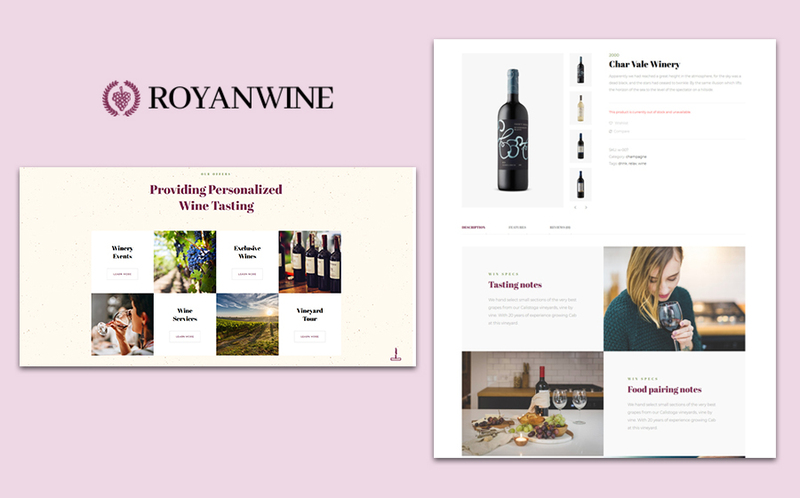 Very simple yet cozy and warm color schemes and design patterns are combined with Wine WooCommerce WordPress Theme to get wine lovers indulged in your store.Fully-fledge WooCommerce store helps you make the most out of online cellar. Customers can take a closer look to every single wine bottle, see details, origins, check reviews, and instantly add items with Ajax cart. Flexibly show hi-tech products, mobile devices, gadgets, digital accessories in neat and clean layouts. This WooCommerce WordPress Theme makes you a feature-rich tech store where the shopping experience is optimized. Searching through an array of products and filtering to get desired items will be super easy. You are also packed with a bundle of elements and widgets to run a sale or offer discounts and launch special events in catchy style. Numerous choices of headers and footers enable you to highlight contents according to your own purposes. Let fast food lovers experience a vibrant Online Fast Food Restaurant with larger-than-life pictures and dynamic effects. You can show mouth-watering of pizzas and burgers in an active tab which eases navigating and reaching their desired food. Plus, you will get multiple templates to show high-end fast food on a single page with descriptions, reviews, related dishes. The best part is Burger Slap equips you with a bunch of thoughtful designed inner pages. To be more specific, you can resourcefully show off food catering services, announce and promote events, present support center, introduce your team and values, and make your fast food chains approachable for customers with consistently visible contacts details and maps. 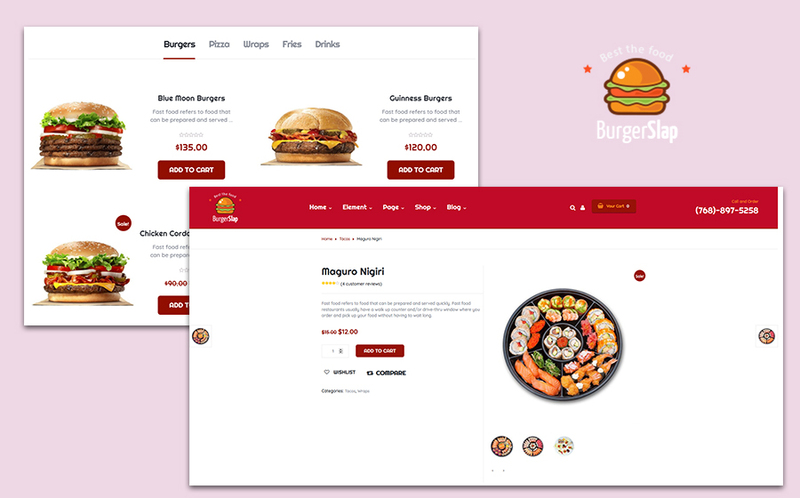 Burger Slap is a solid solution to a Premium Responsive eCommerce WordPress Theme for your fast food chains! This Summer shop eCommerce WordPress Theme comes in with bright and mesmerizing templates which can make online shoppers linger in your store. While optimizing your WooCommerce store for quick and easy searching, filtering, and reaching desired summer outfits and swimwears, Sunbox boosts your sale campaign with catchy banners and labels for discounted products. 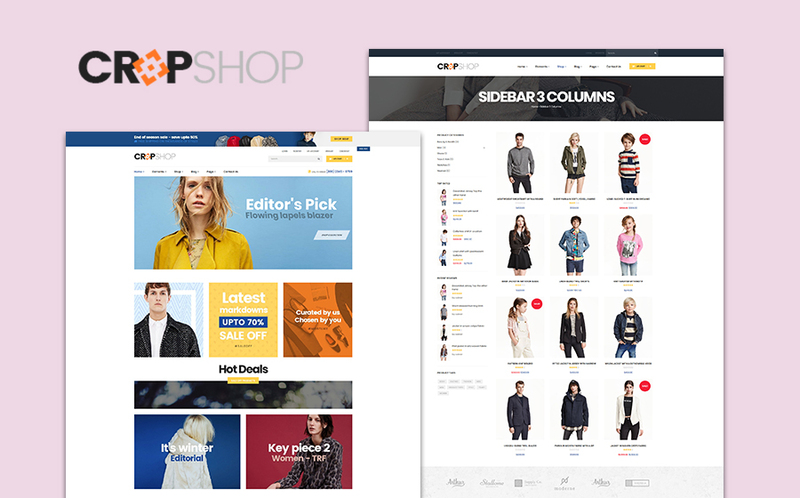 Your department store will need such a neat and purposeful Fashion eCommerce WordPress Theme as Cropshop. There are not many showy effects integrated into this theme. Instead, Cropshop focuses on providing your customers with pleasant shopping experience in finding garments, hunting sales, adding items to cart, and sharing their favorites. Besides ready-made templates, you can make use of myriad elements, buttons, typography, indicators to create your own unique appearance for your clothing and fashion eCommerce store. 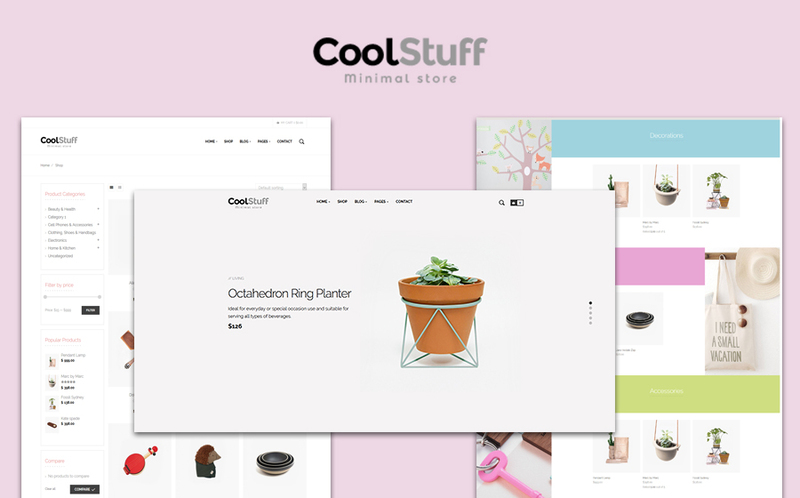 CoolStuff is an ideal Multipurpose eCommerce WordPress Theme for your vintage style oriented store well built in the powerful page builder Visual Composer. Vintage recycles art and handmade product manufacturers can show all kind of products ranging from clothing, accessories, plants, and furnitures, and so on. Fully-fledged WooCommerce store makes it easy for customers to see details, check reviews, and sharing on social media. 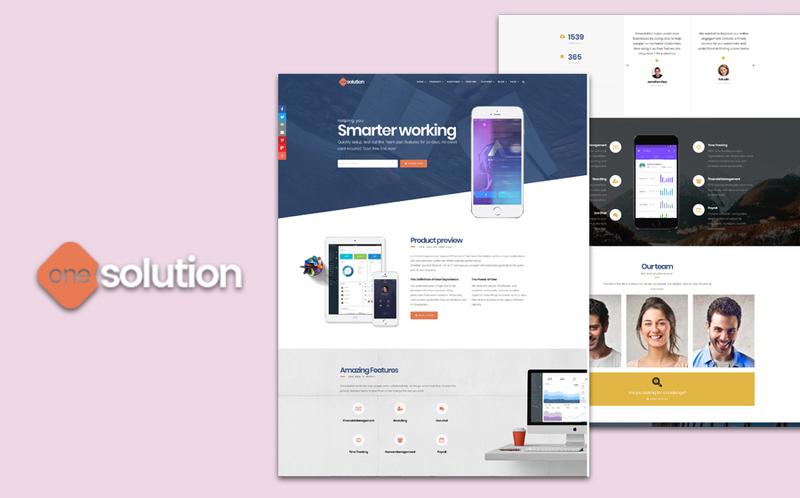 Creative eCommerce WordPress Theme for application showcase that will make your innovation stand out. Versatile templates with numerous widgets, elements, tabs, sliders, and smart graphics designs allow you to flexibly illustrate your advanced features. You will get everything you need to make a rational presentation on how your apps effectively solve problems. In search for modern and innovative designed eCommerce WordPress Theme for your smart tech business? Smaztek is the one that lives up to your expectations. 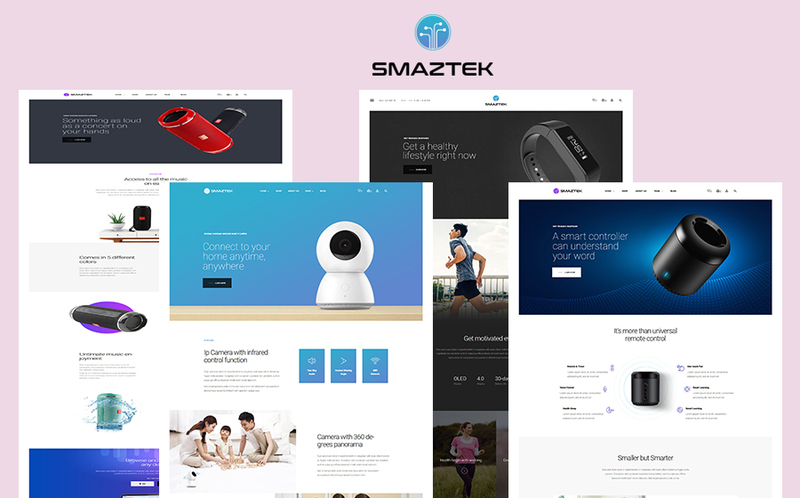 This Technology and Gadgets WordPress Theme has its own way to help you elaborate every single component, tech specs, and advanced features smartly. You can apply graphic patterns, diagrams, catchy lightbox, tabs, sliders, color swatches, and so much more. 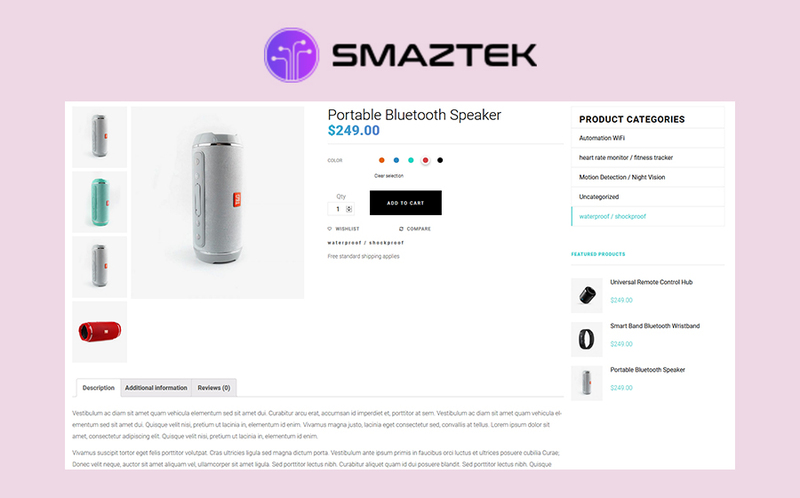 Tech-centric pages make any of your tech products stand out, including home tech, gadgets, mobile devices, and digital accessories. 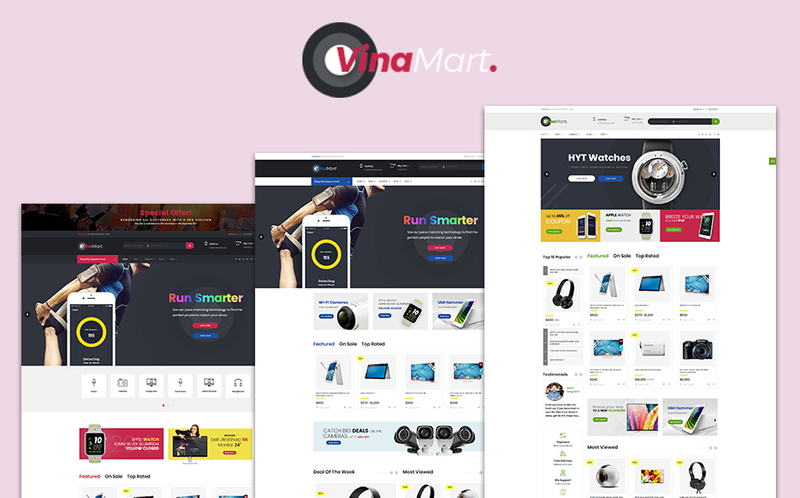 If you are selling electronics and digital products online, Vinamart will give you the optimal solution. It proves that you can totally run a feature-rich website while maintaining fast loading and high performance. This Creative eCommerce WordPress Template equips you with powerful product filter by categories, color, prices, and tags. It lures customers into discovering your store more and more thanks to smooth navigation experience generated by Mega Menu and well-linked components. Product varieties can be displayed in eye-catching styles of layouts. You have multiple choices to highlight your products! 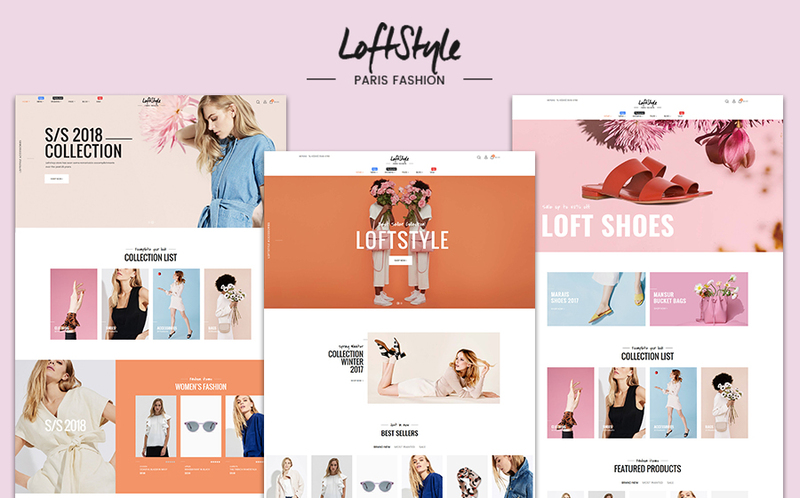 Your fashion store will shine with this elegant eCommerce WordPress Theme. Delightful and compelling design and exciting hovering and loading effects will definitely a bonus to your customers’ shopping experience. You will get 5 chic and tasteful Homepages that are carefully crafted to suit any of your purposes. Integrated WooCommerce is not just usable, it is optimized to be clear, light, and focus on customers’ needs, including a visual display, product details, review, related products, lookbook, social sharing, and so on. You have hit on a brilliant idea of an online store for sports workout, fitness, and home gym equipment and yet find any favorable eCommerce WordPress Template for your online business to thrive. Then, you should check out Exgym. You are well supported to apply a dynamic and energetic appearance for your site instantly and effortlessly. There are up to 5 Homepages for you to choose, and they all come in with crated-to-perfection WooCommerce shop. 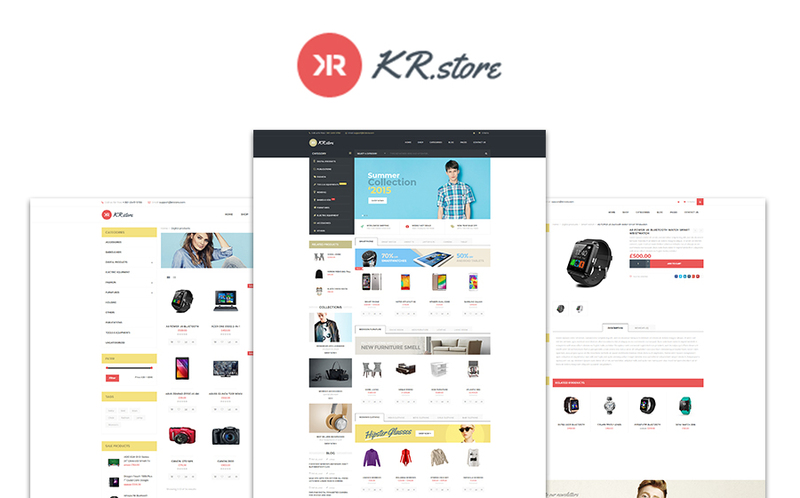 Another masterful eCommerce WordPress Theme for a department store that brings you sales is KrStore. Dense yet well-organized components is dedicated to showcasing all kinds of products from digital products, tools, gadgets, equipments, to clothes, and accessories. Seamless navigation is generated thanks to both horizontal and vertical Mega Menu intergrated. If you are looking for a sharp and clear Multipurpose eCommerce WordPress Theme, Emarket should be on your list. You will see a consistent style and clear division from sections to sections instead of dazzling or colorful design. 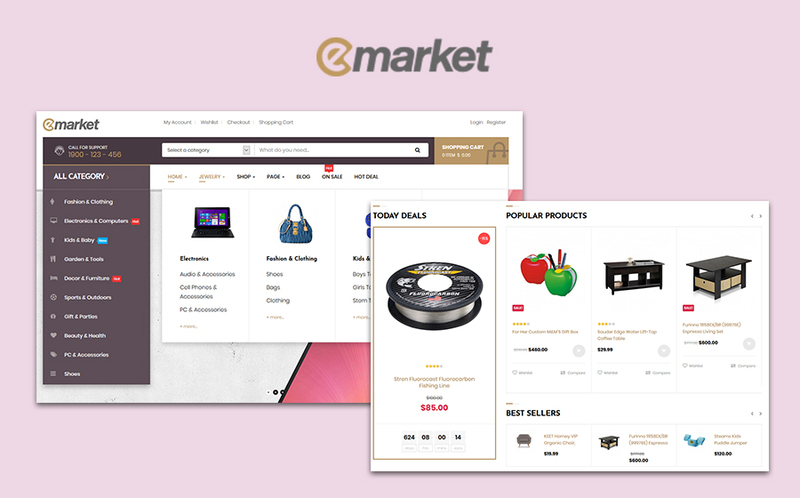 Yet, Emarket is supposed to give you fast loading speed, easy navigation, and excellent performance. Trendy templates are bundles in a Responsive eCommerce WordPress Theme to effectively get your store catch on. You have everything you need to showcase all your attire fashionably and creatively. This fashion WordPress Theme makes it super easy to display items in enchanting components, sliders, and pixel-perfect pictures. You will get 5 Homepages and unlimited skin color to paint your unique WooCommerce store. 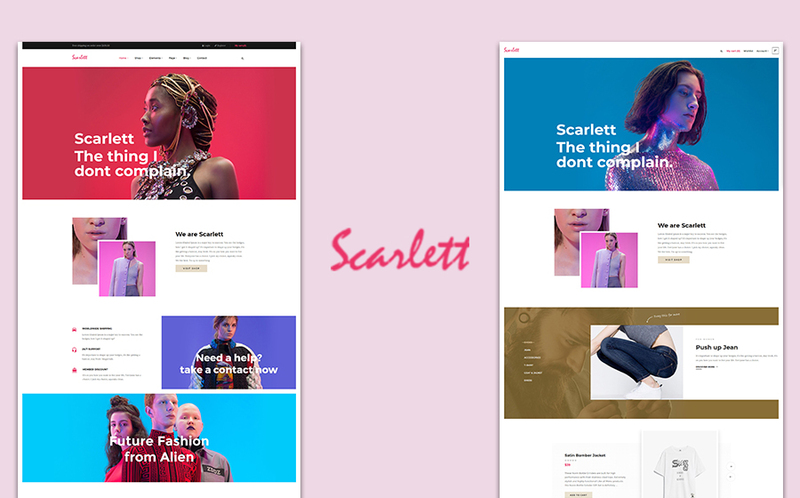 With Scarlet, you can build a fashion store where any fashionista would love to visit! Hopefully, provided information will be useful for you to determine which eCommerce WordPress Theme suits the best for your business!